The Copp Clark Co., Limited, Toronto. 1926. J.M. Dent & Sons, Ltd, London & Toronto. 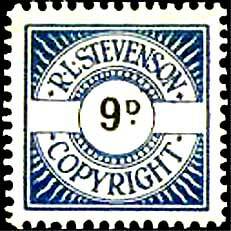 1929.
but "copyright stamps" which were pasted into RLS books. 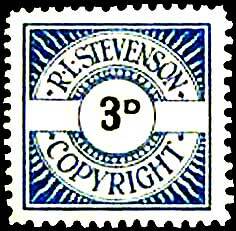 They were usually attached at either the top or bottom inside of the back (or rarely, the front) cover of Stevenson's books, and were for the collection of royalty fees. 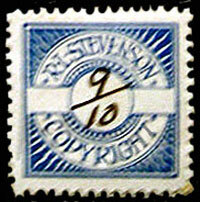 The 1912 General Regulations allowed for the collection of copyright royalties on published works by means of stamps. 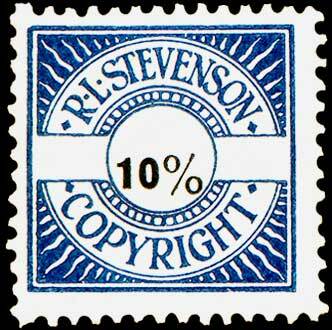 The stamps were produced by the Society of Authors, Playrights and Composers, at the request of Stevenson's heir and stepson, Lloyd Osborn, between 1925 and 1944, to facilitate his collection of royalties on his stepfather's works. The Society's Collection Bureau charged a 15% fee for their services. 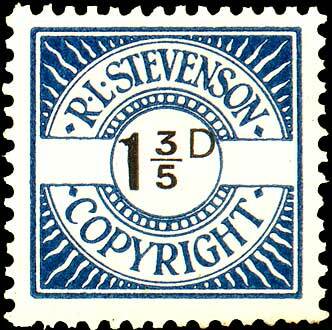 Harrisons & Sons Ltd. printed the stamps, in various values ranging from 3/10d up to 1s6d, which represented 10% (UK Copyright Act of 1911) of the retail price. They maintained a base stock of blank and common values, and printed the appropriate value on the blanks as necessary. Other values were issued for Canada in cents, and India in annas. 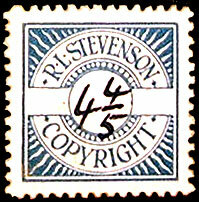 Special volumes not for general sale, such as review, educational, or library presentation copies, had stamps marked "Presentation", on which no royalties were paid. An estimated 1 million copies of the various values were issued. 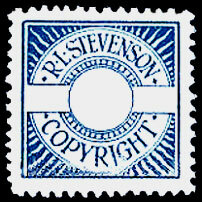 Copyright Stamps - R.L. 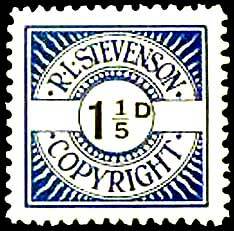 Stevenson 1924-1944. J.W. Brodie, Cinderella Philatelist, 25/3, January 1985. R.L. 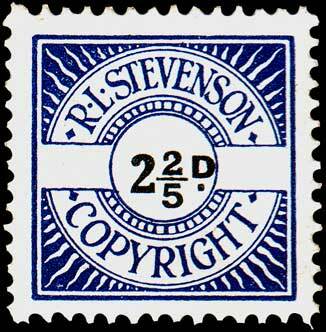 Stevenson Copyright Stamps - an update. Adam Miller, Cinderella Philatelist, 36/2, April 1996.